Eve falls to the ground, in the form of a grotesquely transparent child titan, accompanied by a cigar shaped mother-ship in her descent onto a flowery marshland. 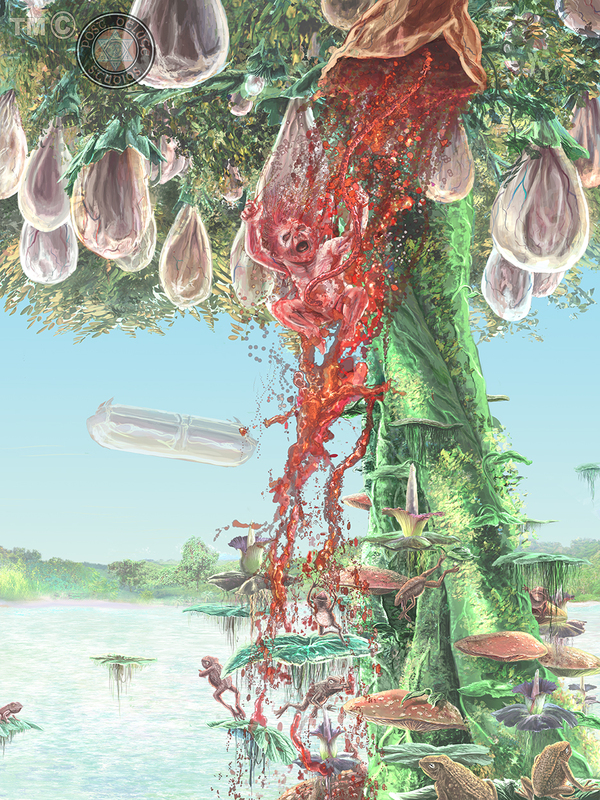 A waterfall of blood and fetal fluid crashes down onto an aquatic landscape, teeming with giant toads which feed off the vital nutrients. It is so humid that vegetation sprouts out of thin air. This is indeed the land where the spiritual and physical Garden’s of Eden meet, in a prehistoric fantasy land. Above is the link to a recent interview I had with Indyfest Magazine. In the interview, I talk with Jennifer Vanderbeek, on my latest endeavors as a freelance writer and illustrator. In the original interview (done via e-mail), a lot of questions were asked and answered without being published in the final interview, however, she does a decent job of wrapping it up succinctly. The article covers my time working on SWIPE, the project I did with writer, Park Cooper, colorist Jay Moyano, and publisher Angry Viking Press. As well my current position at Post Deluge Studios, giving insight on how the Disintegration of Eden became a feature project. It’s good to go back and reflect on previous projects done recently, and though I’ve come a way from where I began, I still have such a long way to go. If you have bought SWIPE, I hope you’ve enjoyed the book, and if you haven’t, I would suggest you order a copy from your local comic book shop. Or, you can order directly from the publisher. Disregarding God’s Warning and Adam Revised from the Disintegration of Eden are now included at Gods-and-Monsters.com! It’s a great place to explore, and find more fascinating information on our ancient past, and learn that ‘mythology’ is recorded ‘history’, handed down by our ancient ancestors over epochs. Hopefully we will see more work from this series included in the future. In the meantime there’s more work from other artists to check out on their Mythical Artwork and Monsters page!